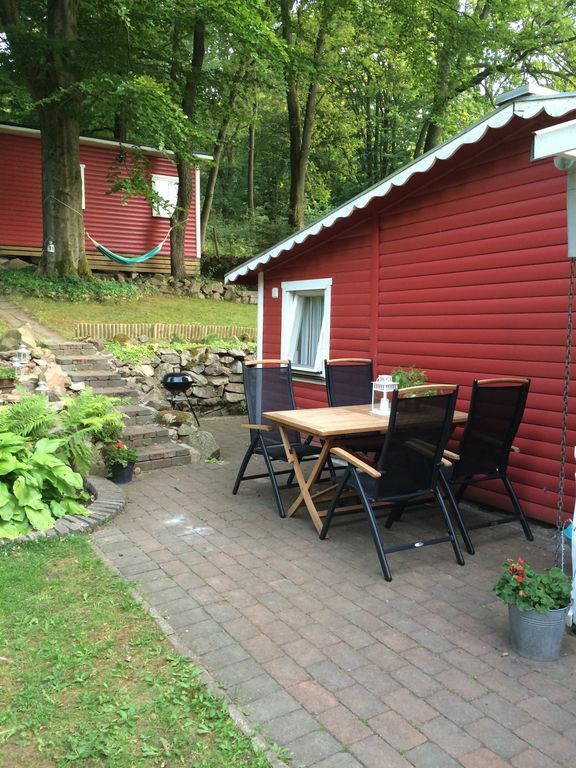 Refurbished and fully equipped cottage on Söderåsen close to both hiking and fishing. In the living room which is at 50sqm are two bedrooms (one with double bed and one with twin beds), fully equipped kitchen, living room with fireplace, sofa and dining sets and the bathroom has a shower and composting toilet. The smaller house is a 15 sqm large bedroom with two single beds. On the grounds there patios and barbeque facilities on fine evenings. Söderåsens nature surrounds the plot and Skåneleden stage 3 is only 600 meters from the cottage. The bathroom contains a shower, sink and composting toilet. It is possible to order final cleaning at a cost of 100€. It was our first experience of Sweden and we did not know what to expect, but it was all worth it. Our holidays in the cottage was abosolutely great. The owners of the cottage are very hospitable. Everything was available in this sweet cottage, even wifi which made our kids (3) very happy :). Beautiful setting in the woods, great nature and wild life, just a few steps away. In the evening it is very quiet, no noisy traffic :). The weather was fine...in the evenings we made walks, made a little campfire at the fire place in the garden. A great base for making trips in the south(west) of Sweden, which we did. The opportunity for horse back riding was 20 minutes away from the cottage. It is worth making a trip to the nature reserve of Kullaberg. All together this was a great stay for us. We certainly will come back to Sweden. If you love the things mentioned above, this is the cottage you want. Barry, José, Famke, Bjarne and Ilse. Boligen er super hyggelig, fint sted for familie med børn. Vi havde valgt boligen ud fra at der ikke skulle være en sø i nærheden, vi havde vores lille Barnebarn med. Skoven gav god læ, men skoven betød også at der ikke kom særligt meget sol ned på grunden. Hyggeligt sted. hyggeligt område, det kan vi godt finde på at leje igen. Sehr ruhig gelegen, das Haus passt sich perfekt ein in die Umgebung. Wir haben uns wohlgefühlt. Zeer compleet ingericht, in een prachtige rustige omgeving. Het toilet is even wennen, maar is zeer eco-vriendelijk!! We hebben er een geweldige week gehad, met uitstapjes naar Malmö, Helsingborg en de dichterbij gelegen stadjes Kvidinge, Åstorp en Klippan. Vooral de rit door de bossen naar Malmö was een mooie ervaring! De support van de eigenaren was prima: ze waren direct bereid om te komen helpen als er iets was. Ik zou er zelf direct weer een boeking doen (misschien volgend jaar weer!!!) en het iedereen aanraden! Die Hütte ist schön eingerichtet und hat einen Kamin. Sehr gemütlich und ruhig gelegen! Zu zweit hatten wir sehr viel Platz. Der Nationalpark Soderasen ist ganz in der Nähe und sehr schön zum Spazieren gehen. Our red cottage is on the hillside of Söderåsen. It is surrounded by beautiful beech forest. Within walking distance is the beautiful joint (Skåneleden) that goes across Skåne, waterfalls and hiking trails. On the Söderåsen you will find outdoor experiences beyond the ordinary with both fishing, hiking paths and the opportunity to go canoeing. The wildlife and plant flora are abundant on Söderåsen, and for those who are interested there is also opportunity in hunting. The famous Klåverödsdammen is located less than 20 minutes drive from the cottage. There are also various hiking trails to experience by foot. In summer there is the opportunity to swim in both lakes and swimmingpools nearby and for golf enthusiasts, there are good golf courses within reasonable distance ..
• Städning, handdukar / sängkläder ingår inte i priset utan kan bokas till för en extra kostnad.